Do you workout? Maybe take walks? Lift a few weights? Or do you ignore all that stuff and neglect your fitness? Don’t. Commit to improved health right now. Just a little bit every day until you make it a positive habit. But I don’t care if you get 6-pack abs or not. I’m more interested in the muscle between your ears because that’s THE most important one. Get that one fit and it’ll serve your entire life well. Last week Undeniable with Dan Patrick premiered on the Audience Channel, a DIRECTV exclusive. Joe Buck used to host the show. Dan’s first guest was Ray Lewis, Hall of Fame linebacker for the Baltimore Ravens and 2-time SuperBowl champion. Listening to Lewis’ story made me realize I didn’t quite judge him correctly. Ray’s story is interesting and like all great stories, it includes a ton of adversity and determination. We’re surrounded by books, articles and podcasts sharing stories of intense resolve by people of extraordinary talent (like Ray Lewis) and people who are far more common and ordinary in their natural talent. But they’ve got something others don’t, a very fit mind. A strong mind. Most of us have heard such things all our lives. It still seems like hocus pocus for many of us. Just so much mumbo jumbo. I suppose that’s why it works so marvelously for the few who are able to really engage their brain with whatever they’re trying to achieve. It largely hinges on how driven people are to get their mind in gear toward a pursuit. What do you most want to accomplish? What’s the very next step? I pose these 2 questions because it seems to me they reveal the stumbling block facing many people I encounter. And they also represent the stumbling blocks that often get in my way. The human mind is able to hold two contradictory thoughts. That doesn’t mean we ought to practice that. We’re also able to have many ambitions. Dreaming and imagining provide countless fictional opportunities for our life. They may be fictional only because they’re not yet real. Or they may be fictional because there’s no way they’ll happen because we all have limitations. Ray Lewis was a Hall Of Famer not merely because he had his mind made up to be a great football player. He had the talent and physical skills necessary. He needed both. Natural talent and skills are required, but without a mind made up…Ray Lewis wouldn’t be in the Hall. Lots of football players have tremendous physical talent and skills, but they lack a strong muscle in their head. All the possibilities can distract us from growing great. Entrepreneurs can pursue this idea, or that one, or fourteen others. We can do it this way, or that way. Or a hundred other ways. It speaks to the WHAT question. What do you most want to accomplish? We all have to settle on something. It doesn’t mean that has to be our one thing for all time, but it means our lives need focus – a singular purpose – if we’re going to develop a strong mind. Weight training illustrates the point. A person walks up to the bench and engages in a one exercise at a time. Circuit training can involve multiple exercises, but they’re happening one movement at a time. Bench presses are the focus. Or something else. That’s the focus in the moment. What’s your focus in this moment? Sometimes people ask me about podcasting because I’ve been doing it for so long. I’ve talked with people who want to start a podcast, but they don’t know what they want to talk about. Others have told me they’d like to do an interview show, or maybe a show about some hit TV show, or about some book series. These people have no focus. Their attention isn’t directed toward anything except starting a podcast. Most of them never did start. In part, it’s because they didn’t figure out what they wanted to accomplish. They just wanted to start a podcast, but that’s insufficient. That’s a weak mental position that won’t produce anything other than a thought or a dream. 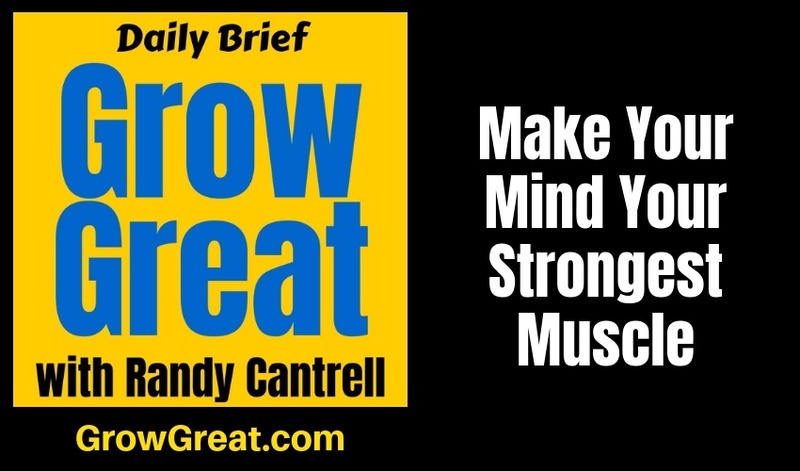 Make your mind your strongest muscle by settling in on one thing you most want to accomplish. Business people can be among the worst to have a thousand great ideas. The hard part is to take an idea from start to profit. To keep enough focus – to make your mind strong enough to hold a single ambition long enough to achieve success. So often people start, then peter out before the thing has any hope of getting anywhere. That’s why that Ray Lewis quote I saw on his interview struck me. For many of us the hardest thing to do it to maintain the mental resolve to press on until we succeed. We often quit too soon. If you can set your mind toward a single goal, then you can make your mind an even stronger muscle by figuring out the very next step. Just the very next step. You’re tempted to want to figure out every step between here and the final destination, but that won’t make your mind stronger. Truth is, that’ll weaken your mind because you’ll start crossing bridges in your imagination that you may never have to cross. Looking too far ahead will distract you, weaken you and likely cause you to veer off course. Learn to live by one question, “Now what?” Some may prefer another version of that, “What’s next?” It’s the same notion. One step at a time. Just take the very next step, then figure out the next one after that. People can be so prone to want to get every step perfectly right that fear stops people from moving at all. Which is why many dreams die on the couch. Inaction. Too much sitting around. No muscle, including your mind, is made stronger without exercise. Your mind needs your body to engage in doing something about the thoughts and ambitions. That’ll make your mind strong enough to drive your life across the finish line of whatever you hope to achieve. There’s something else about getting ahead of yourself. You’ll talk yourself out of doing what you most need to do. Doubt and fear creep in when you get too far ahead. That’s the sign of a weak mind. Strong minds hold firmly onto the most immediate action needed. So much so, the strong mind takes that action! Then figures out the next action to take. If you’re a physical fitness nut, that’s great. But don’t neglect the muscle that you need to be the strongest of all – your mind. Few things are more powerful than a mind made up. Be well. Do good. Grow great.